Museums, in order to achieve accredited status, must adhere to correct standards and policies. Alongside this it is essential to address the ethics of dealing with certain collections items. Collection items such as human remains. The conversation is an interesting one to have – should museums display and/or store human remains? Do they even have the right to? What gives them that right? What are the advantages, or the disadvantages? And how should display and interpretation be attempted, what is there to accomplish? 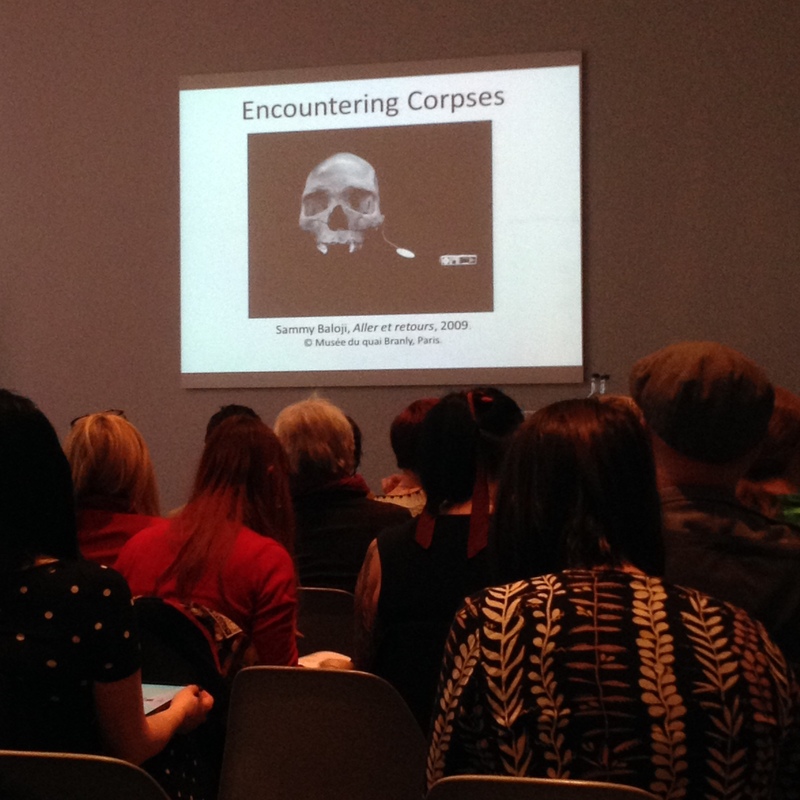 This is why I jumped at the chance to attend ‘Encountering Corpses’, a day of lectures and debates presented by Manchester Metropolitan University’s (MMU) Institute of Humanities and Social Science Research (iHSSR) and held at Manchester Museum (MM). The event aimed to “specifically address how the materiality of the human corpse is treated in and through display, exhibition, sanctification, memorialisation, burial and disposal”. This meant that although I was there purely from a museology view point, a wide range of issues in contemporary society were also going to be lectured by various speakers, including the grieving process, death being represented in art and the habits of serial killers. The day was composed of three panels with an overall eleven speakers and a tour of Manchester Museums Egyptology / Ancient Worlds gallery’s with Manchester Museum’s curator of Archaeology, Dr Bryan Stich, and curator of Egyptology, Dr Campbell Price. Dr Craig Young, Reader in Human Geography at MMU began the day with an image of a skull. The skull was one of a murdered Colonial Chief that is now held at the Royal Belgian Institute of Natural Sciences, in Brussels. The photograph transformed the skull into a mere object of science, not illustrating or conveying what it truly is. This brings up the various issues of holding human remains, the ethics, the policies and the political implications before you even reach the actual reality of the object, the history of the Colonial people and a reflection of humanities ultimate other. There has, undeniably, been an increased interest in human remains in when once death was an untouched topic not discussed, now presentation, display and even disposal issues are emerging into new light. Popular culture has resulted in a social recognition of people’s attitudes towards dead bodies. Television shows such as CSI: Crime Scene Investigation in conjunction with what some people might deem morbid reality, dark tourism, death and remains are becoming extremely more visible. Donations to science, global trade in body parts, burials… there is numerous ways in which we encounter corpses in modern day, but has this desensitised us to some extent? How would this then shape how we view the body and how we see it as an artefact, how would we react? How do people perceive the dead body if it is lay out as a whole or just as a skull, for example? Would that reaction differ if the body was lay for a burial, or for science? The certainty is, bodies will decay and so there is limited time to consider these issues. Human remains are conceptualized by society in a fog of whats, whys and hows. Is it even ethical to treat these remains are artefacts or should there be that degree of respect that recognises their ancestry aside from the academic? Should we be addressing them as materials or as individuals, in a relatable manner that we recognise, in the same language we would refer to our deceased family members? The mobility of dead bodies has increased; this has thus brought them more to our attention. “The final journey”, the journey to the grave, is being seen more often in much more exaggerated ways. When Diana, Princess of Wales died in 1997, it is estimated over 1 million people lined the streets to witness her final journey. Seeing her body was an emotional experience despite most of these people never once meeting her. Other examples highlighting mobility of corpses includes the case of the Serbian Royal family who, in May 2013, were exhumed from their graves and returned to their home to be reburied after dying far from home (in various countries) many years earlier. Or the case of Petru Groza. Groza (1884 – 1958) was the Prime Minister of Romania and a highly respected man. When he died and was so buried in 1958 after a lavish funeral it became obvious that there was no particularly special place for people of high power and admiration to be buried. In 1965 such a place had been constructed and so Groza was exhumed and reburied in a grand and decorative mausoleum during another large and lavish funeral. Despite all this effort, this was not Groza’s wish. He has expressed in life that he very much wanted to be buried in his home town, Băcia, close to Transylvania. Knowing this, one night his body was stolen by family and friends from his home town and returned via bus, and reburied once more for the third time and in an unmarked grave – the ending he had hoped for, be that after a much longer journey than he probably expected. Famous graves have fuelled what is now known as dark tourism. Many thousands of people will visit the final resting places for their heroes and idols but despite a natural aversion to death and dead bodies, would people still visit a grave if there was no body in the ground? Probably not. Unfortunately this is a notion that is quite apparent and most likely one of the driving forces in the current battle of where exactly Richard III should be buried as he will attract tourism like no other medieval king does. “The body of this man was discovered in August 1984 when workmen were cutting peat at Lindow Moss bog in North West England. It was carefully transported to the British Museum and thoroughly examined by a team of scientists. Their research has allowed us to learn more about this person – his health, his appearance and how he might have died – than any other prehistoric person found in Britain. The conditions in the peat bog meant that the man’s skin, hair and many of his internal organs are well preserved. Radiocarbon dating shows that he died between 2 BC and AD 119. He was about 25 years of age, around 168 cm tall and weighed 60-65 kg. He had probably done very little hard, manual work, because his finger nails were well manicured. His beard and moustache had been cut by a pair of shears. There is no evidence that he was unwell when he died, but he was suffering from parasitic worms. His last meal probably included unleavened bread made from wheat and barley, cooked over a fire on which heather had been burnt. The man met a horrific death. He was struck on the top of his head twice with a heavy object, perhaps a narrow bladed axe. He also received a vicious blow in the back – perhaps from someone’s knee – which broke one of his ribs. He had a thin cord tied around his neck which may have been used to strangle him and break his neck. By now he was dead, but then his throat was cut. Finally, he was placed face down in a pool in the bog. This elaborate sequence of events suggests that his death may have been ritual killing. Some people have argued that he was the victim of a human sacrifice possibly carried out by Druids. In 1987 Lindow Man was displayed at Manchester Museum, arguably what should be his home location, on loan from the British Museum. For this exhibition a ritual sacrifice reproduction was adopted in order to tell his story. However, as visitors to museums have become much more aware of ethical issues in this environment in regards to human remains due to contemporary concerns of human tissue storage with no official permission, it has become much more problematic over the years to offer an accepted interpretation. And so, when Lindow Man was to be redisplayed at Manchester Museum in 2008 the staff took a different approach. They carried out a public consultation and acted upon their findings. The wide range of people consulted from the community voiced that they wanted him to be treated and shown with respect and for the exhibition to reflect that there are different ways to approach interpretation. Overall though, the exhibition had 160, 000 visitors, 12500 of whom completed comment cards resulting in 67% agreeing that museums have the right to, and should, display human remains. Next up, Dr Campbell Price discussed “Egyptian Mummies in the Museum: Authenticity, Curiosity and Revulsion”. He initially makes the obvious observation that mummies are the most popular exhibits in museums (though one might be inclined to suggest dinosaurs may be more so) and they do continue to be the go to item when considering the public perception of Egyptology. Despite museums being expected to provide definite answers and facts people still question them. Outside of academia people have very little direct experience with mummies. The only contact they will have had will be in the same context as vampires and werewolves, in horror stories and movies – fictional monsters. So it is understandable that the illusion is upheld. Ironically, I mentioned dinosaurs being more popular and at Manchester Museum this might be so, even though their mummies are authentic yet their T-Rex, Stan is a cast. Margaret Murray (1863 – 1963) was an Egyptologist and Anthropologist, primarily known for her work in Egyptology. She was one of the first people to put together a multidiscipline team which went on to work on the unwrapping of two mummies – brothers. One was unwrapped in private but the other, in 1908, was unwrapped in front of 500 people at Manchester Museum. Murray was the first woman to do this; she wanted to show that Egyptology wasn’t just about ‘hocus pocus’, for this practice was able to expose the mummy’s diet, health issues and more. At the time Murray even gave bits of the wrappings from the mummy to people from the crowd. Manchester Museum still gets contacted about these pieces. Following on from this another Manchester Egyptologist unwrapped another mummy and this was televised. From this it is easy to make the assumption that Egyptians were ‘obsessed’ with death as mummies, canopic jars etc. are the core of most museum collections but there is a very simple explanation for this. The Ancient Egyptians buried their dead in tombs along with their belongings – this is what has essentially preserved them. Settlements are much more susceptible to damage, the tombs offered protection to enable their prolonged survival. Price went on to introduce us to Manchester Museums first mummy, acquired in 1825, The Lady Asru, c.650 BC. Asru has been unwrapped as in the 70’s unwrapping a mummy (often after a dinner party) became a popular form of entertainment. Now, however, she sits semi covered. 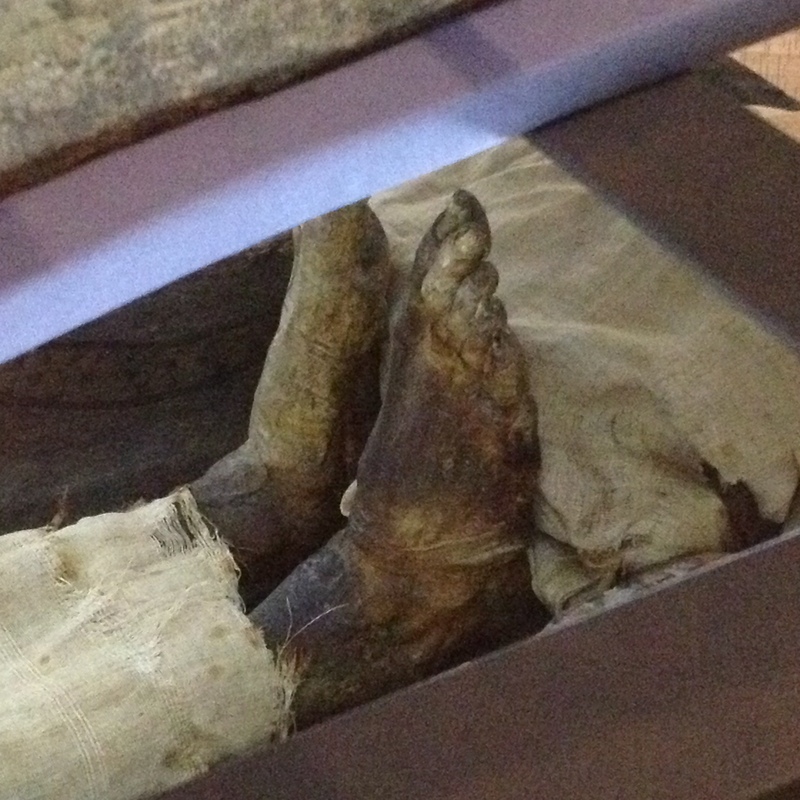 Her head and feet are exposed but it is said, not just of Asru but of all mummies, that it is the hands that allow you to make that connection that humanises the remains. We then went down to the public Ancient Worlds gallery where Asru lays today. Next to the case in which she is displayed sits a facial reconstruction but this might only assist in the confusion of who she is, real or not. Asru’s father was named Pai-Kush, Kush meaning he was a Kushite man and likely high up in the ranks, maybe even serving as a Kushite king. This information, the family tree, may be more useful in identifying Asru’s provenance and putting her life into more context. The debate of human remains in museums is on-going and mummies are prevalent pieces of the puzzle and so perhaps it is important that the Ancient Egyptians have their say? There was a certain degree of belief in Ancient Egypt that once you died you became a statue, an object. Yet the question we are considering is do we treat them as human beings or as museum objects? After viewing Asru it was clear that seeing her as a human being was not as easy as you might think. One delegate likened her to an alien – she has an alien name, not one you would hear today, she looks different and sits in what almost looks like a space ship (her coffin); it was very clear that she is not one of us. Would this reaction have been any different though if her name had been Emily? Find out more about Asru on Dr Campbell Price’s blog HERE. The following speakers spoke of the representation of human remains in other aspects of life, not museums. The next panel included Emma Fox, Dr Julie Rugg, Dr Faye Sayer and Sam McCormick. Fox currently conducts tours of Southern Cemetery in Manchester where many famous names have been buried. Almost from a dark tourism angle she spoke of her experiences conducting the tours and the overall process of putting forward her idea to start the tours and the general running of the cemetery. Rugg looked at the actual history of burials and how they have changed as people’s attitudes have changed towards dead bodies. A Victorian regulation issued by Sir Edwin Chadwick (1800 -1890) suggested that if you constructed a grave correctly, at the right depth, in the correct environment and with good drainage you could induce faster decomposition and the grave could be reused in an estimated 25 years. Having one coffin in a grave is essential to this as he believed the toxins released from the bodies would mix something terrible. This did not go down well with families as they were often buried in an extremely deep grave stacked on top of each other, this was seen as protective and represented that they were loved. Chadwick’s theory suggests that the bodies were seen as dirty and polluting items. The famous dead are treated differently though. Because of their status they are treated almost as if they are public property often treated in ways you wouldn’t want family members treated. For example, Lenin – his body was preserved in the most violent of ways. Dr Faye Sayer from MMU spoke of ‘Bones without Barriers’ and the social impact of excavating human remains in the public domain. It’s a controversial topic as the viewing of human remains is considered macabre, and morally and ethically distasteful. Despite this Sayer spoke of the project held at the Anglo-Saxon Cemetery at Oakington, Cambridgeshire and of how she gained a ministry of justice licence to excavate human remains without barriers and screens, exposing the process and providing a unique opportunity to explore public engagement and their relationships with the dead. When the project began people stood behind a fence to view what was happening even though it was open for them to enter. By the second week they were venturing towards the trench and asking questions, ownership had begun and they were starting to treat the bodies as part of their community. Towards the latter part of the project people began to offer up their own interpretations of the remains, to understand them as if it had become their duty to do so. Finally PhD student Sam McCormick spoke of her research on ‘Ash Creations’. 75% of people who die are cremated and 60% of people collect the ashes from funeral homes to dispose of them personally, in their own individual ways. Disposal methods are evolving with new ones developing all the time; now you can send your ashes literally in to space! Traditional scattering might soon be in the minority. In the last decade the material dead have shifted and ‘encountering corpses’ doesn’t have to mean an actual corpse. Ashes Creations means art, glassware, jewellery, ceramics, vinyl records, oil paintings and tattoos that incorporate cremation ashes within them. This is not a replacement for complete disposal as only tiny amounts are used but it allows for after-death relationships to continue. Whereas a grave is retrospective of someone who was this is an on-going remembrance, an outlet that allows the person to be there, that relationship that was established with a loved one is allowed to continue. One of Paul Koudounaris’ photographs on the cover of the program. All the speakers encapsulated the very fact that the dead still have a role in the living world. Be that educational or spiritual, they have a job to do and a definite place within museums. Following a break Lee Mellor spoke of the attitudes of prolific serial killers towards their victims’ bodies and Sue Fox and Paul Koudounaris of their current art projects concerning taboo images of autopsies and decorated Early Christian martyrs skeletons. Both of which feature in the accompanying photography exhibition currently at Sacred Trinity Church, Salford until Thursday 10th April 2014. Find out more on the Encountering Corpses Art Exhibition HERE. Find it Friday! – Week 39. 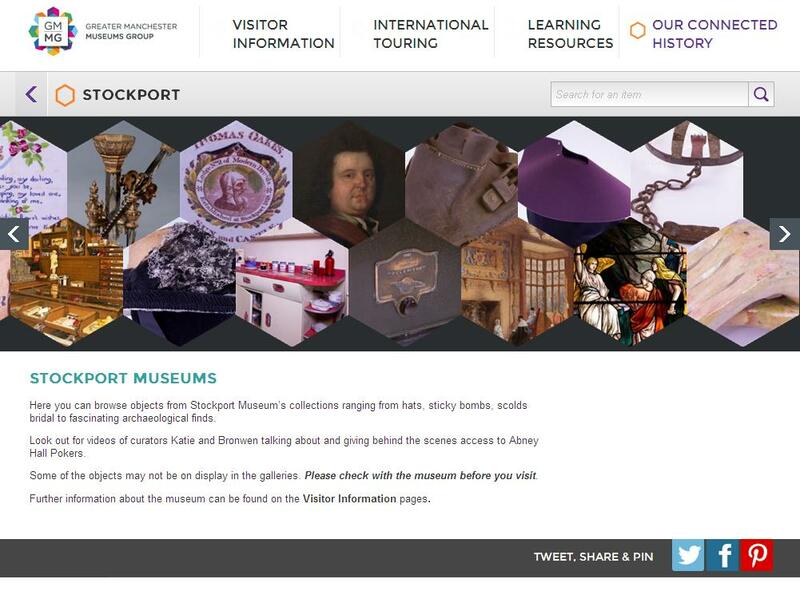 The redevelopment of Stockport (Story) Museum is, of course, going to highlight some famous, iconic or influential names when thinking of who comes from Stockport and who helped shape it in to the town it is today. This is a topic I have already considered in a previous Find it Friday HERE whilst discussing Wimbledon champion Fred Perry. But through my research I uncovered another Stockport born chap that was a pleasant surprise to me. My hobby is collecting books, I am an avid reader and I enjoy a number of genera’s and authors. However one of my favourites (in fact, he is one of my top two) is Edmund Cooper. Cooper was a Science Fiction writer of short stories, novels and poems. He was born in, surprise surprise, Stockport! Born in Marple, Stockport in 1926 Cooper shares a home town with many, notably Karl Davis who portrayed Alton Lannister in TV’s Game of Thrones. Cooper was in the British Merchant Navy until 1945 and trained as a teacher when he left. After World War II had ended he began to publish short stories and his first novel, ‘Deadly Midnight’ which was later renamed ‘The Uncertain Midnight’ was published in 1958, and it’s a good one! That is, if you enjoy speculative futuristic stories of what life will be like when everybody is assigned a personal android. As a rule, I don’t but I thoroughly enjoyed this one. Earlier, in 1957 one of Cooper’s short Stories ‘Brain Child’ was adapted into the movie ‘The Invisible Boy’ which stared Robby the Robot from the 1956 movie ‘Forbidden Planet’. The movie was adapted by Cyril Hume, the screenwriter behind ‘Forbidden Planet’ and ‘The Great Gatsby’ (1949). Edmund Cooper was a prolific writer and wrote under at least four confirmed pseudonyms, including Richard Avery, the name of the main character in one of his books, ‘Transit’, which is possibly my favourite Cooper novel. Cooper was one of the most published Science Fiction authors of his time, an authority that led to him becoming an influential Science Fiction reviewer for The Sunday Times, London in 1967 until his death in 1982. Unfortunately, we have no collection objects relating to Edmund Copper in the collection but that’s not to mean we cannot explore his work using other objects. As is all too common in museums, some of the collection is made up of objects with no information. They could have been accepted into the collection with little or no provenance or that information could simply have been lost over time, but that doesn’t make these objects less important. Various objects can be used to explore various things… a fox for example, can be used to talk of urbanisation or geology pieces can be used to address the evolution of industry, textiles or civilisations. Therefore, for this week’s Find it Friday I have chosen my three favourite Edmund Cooper novels and I am going to find objects within our collection, objects from the stored collection that are not currently on display to help illustrate them. I am not, however, going to stick to objects with limited documentation, after all, even if they are the most documented museum objects of all time, if they are stored away why shouldn’t they be revived and used to help tell more new and exciting stories? Hopefully, the objects can provide the books with a new dimension and the books possibly give the objects the freedom to enter the imagination, to encapsulate the visions Edmund Cooper wrote down, celebrating his work despite not being directly related to Copper. “Michael was quite young when he discovered that some of his playmates bled if the cut themselves, and some didn’t. For a long time he didn’t think about it. Nor did it seem strange to see Zeppelins being attacked by jet fighters above London’s force field, or glimpse Queen Victoria walking with Winston Churchill in the Mall. Not at first. But later he thought about these things – he couldn’t help it. The world was real, and yet unreal. It was all desperately worrying. So Michael and his friends formed a society to investigate the world around them. – A bonnet, once owned and worn by Queen Victoria. – A portrait of Sir Winston Churchill. – Books by William Shakespeare, Mary Shelley, Charles Darwin and Florence Nightingale. “At first he thought it was all part of some crazy nightmare. But it wasnt. Russell Grahame, M.P. was only one of a handful of passengers flying from Stockholm to London. One moment flying peacefully in the sky, the next lying in an un-Earthly green coffin. – Flint flakes (Stone age tools). The passengers wake up on a street consisting of a hotel, a shop and other building that appear fake, much like a film set. They set up camp in the hotel and begin to explore the areas around them leading to encounters with Knights and “cave men” who, as it transpires, are just as lost as the human population. “He was the subject of an experiment seventy light years away from earth. It lay in the grass, tiny white and burning. He stooped, put out his fingers. And then, in an instant there was nothing. Nothing but darkness and oblivion. A split second demolition of the World of Richard Avery. From a damp February afternoon in Kensington Gardens, Avery is Precipitated into a world of apparent unreason. A world in which his intelligence is tested by computer, and in which he is finally left on a strange tropical island with three companions, and a strong human desire to survive. Richard Avery reaches down to touch a shiny, clear diamond like object in the grass, and is whisked 79 light years away from Earth where he finds himself and three other people in a battle-to-the-death situation against alien humanoids, the “Golden Ones”, who have been deposited in the same place, and are equally confused why they are there. When the protagonist finally reaches the spear wielding “Golden Ones”, they are of the opinion that it is merely a game, with the killing of human beings the prime objective. 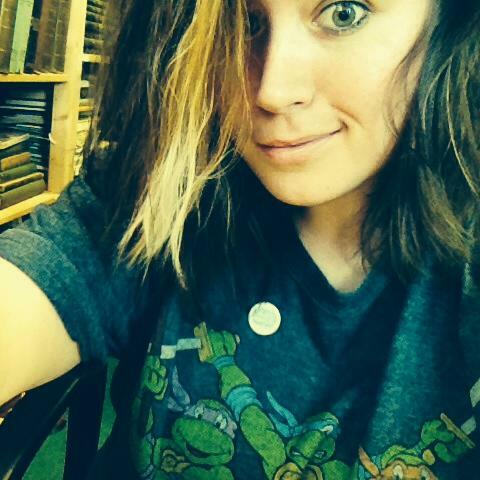 I have been nominated by Claire Miles, HLF trainee curator in Natural History at the Manchester Museum (read her blog HERE) to answer 11 questions about being a museum blogger, a chain blog started during #MuseumWeek on Twitter. 1. Who are you and what do you blog about? My name is Lauren, I currently work for the Curatorial Services that overlook the museums, heritage sites and galleries in the Stockport area of Manchester. The collections for all these sites are stored in one building and I am based there. I am a Heritage Lottery Funded (HLF) trainee in Collections Management and my day-to-day consists of a lot of documentation and conservation of the various objects in the collection. On my blog I purposely try to expose the stored collection that as I am in a curatorial position I have the pleasure to work with every day but that is not currently on display for the public to view. I blog about ongoing projects and the final results, about new donations and about the discovery and reuse of old ones. In fact, I will blog about anything because I love my job and I want to share that. 2. Why do you blog about museums? Some exotic birds were identified using the power of Twitter. I blog because it is the ideal platform to keep a diary for my HLF training and to share my experiences. On one hand it is ideal for me to be able to talk about what I am up to allowing me to connect and network with others and to begin conversations that can be, and have been, global. But on the other hand it has been an essential tool for the museum. Having this has allowed me to gain help in certain areas, predominantly research, from experts that we don’t have on our team and this has, without a doubt, improved the collection and the knowledge and documentation we hold for the objects. Whereas photographs and talking about objects on this blog is great to instantly expose the collection pieces, this information will be able to essentially expose them over a long period of time. Knowing more about the collection means it is there to be used, be that for exhibitions, research or education, the more you know the easier it is to utilise them in the best possible way. Without this blog and Twitter it would have been impossible, or extremely difficult at least, for me to do this. Social media is so important for museums. Along side this though, as I mentioned, I am in love with my job and I want to share that. Curatorial teams are hidden from the public view and are often sadly forgot about. It is easy to see the outputs of an exhibitions or education team but for curatorial everything is behind the scenes. You might not see the documentation, the environmental monitoring or the donation processes for example, but without these practices there wouldn’t be a museum. It might seem a controversial topic, and perhaps I am bias, but it is a fact. I think the foundations of a museum is the curatorial team and blogging about what they get up to exposes that this role is essential to the running and to the survival of museums. 3. And which post on your blog did you have the most fun writing? I enjoy writing as a whole. I enjoy writing about training days I have attended because I come away inspired and ready to run at the new challenges they have highlighted to me. For example the Museums Association event, ‘Moving on Up’ that I wrote about HERE. Admittedly, it is a very long post but I was so excited about what my future could hold, I just had so much I to wanted to say. 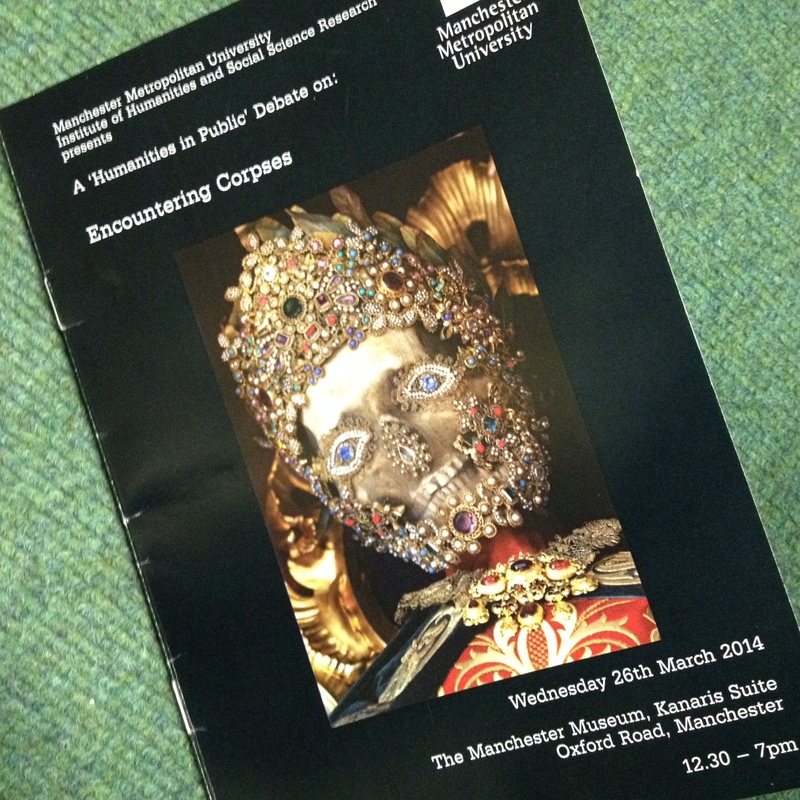 Yesterday I attended an event a Manchester Museum entitled ‘Encountering Corpses’, which again, I loved. I am hoping to write it up by next week because I do think the ethics of displaying human remains is an interesting debate, despite what feelings and reactions that might invoke for visitors and children (and me, see below) it is a must for museums. 4. Which is your favourite museum? 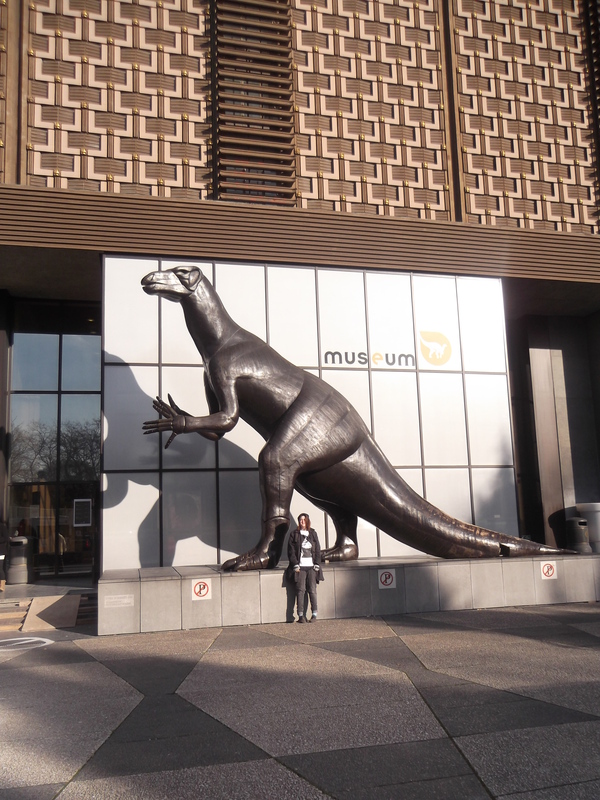 In January 2012 I visited Belgium and The Hergé Museum and The Royal Belgian Institute of Natural Sciences. Being a huge Tintin fan I was excited to learn more of Hergé but at the RBINS I was quite literally blown away. The scale of the museum was insane and I felt tiny in comparison to the large-scale, diorama like exhibits they created; I was in complete awe. The biggest Dinosaur hall in Europe, a whole herd of Iguanodon and a Blue whale erupting out of an ocean scene…. I had to sleep for two days straight to get over my excitement. It is worth the trip to Brussels if you ever get the chance. 5. Do you think you’ll still be interested in museums in 20 years time? Of course! Working in a museum every single day has yet to quell my excitement and love for them as a whole. In various roles, not always in the area of museums that I wanted to be in, I have still loved going to work every single day. I can’t imagine my life without museums and I think that is why I want to have a career within them, as I don’t think that is a reality that anyone should ever have to consider. 6. What is your earliest museum memory? many mummies inside. I was stunned, I was quite honestly terrified and I cried. A lot. I had a lot of nightmares but I was not deterred, quite obviously. In fact, in 2010 I started working at Manchester Museum but I still found walking past that case unnerving. Perhaps this says more about me and a morbid fascination than it does the museum but this ordeal only fuelled my interest in museums. It provided me with a curiosity for what these places were and to what exactly goes on within them. That attraction to the air of mystery museums possess has yet to dwindle. 7. What was the last museum you visited and what did you see? Oddly enough, it was Manchester Museum yesterday to see some Mummies. I attended ‘Encountering Corpses’, a day of talks about the perception of human remains and the ethics and best practice issues surrounding displaying and holding them within a museum environment, where you are most likely to encounter a ‘corpse’ in everyday life and the attitudes towards the dead of scientists, the public, artists and serial killers. Campbell Price Manchester Museums Egypt and Sudan curator gave a brief tour of the Egypt gallery and we saw Asra, the first mummy the museum acquired in 1825. She is dated as being from 650 BC and was unwrapped in the seventies. 8. Share a museum selfie? 9. If you could build a museum, what kind would it be? I think what some people would call a pseudoscience, Cryptozoology, is an important science but there is only one museum dedicated to this in the world; The International Cryptozoology Museum founded by Cryptozoologist Loren Coleman in Portland, Maine. With my background being in Earth Sciences though I would have to have a bit of Geology and Palaeontology in there too. They would be able to coexist quite easily though – The Loch Ness Monster is possibly a living fossil, a Plesiosaur and the rumored existence of Mokèlé-mbèmbé, a possible Sauropod living around the Congo River Basin region. 10. What is the most popular post on your blog? The Find it Friday! series. This is where an object in the collection is brought to you via a weekly blog post. Each week the object is one that I have either been working with or that I have encountered through the week and found interesting. The objects have no connection apart from that they are currently in storage at the curatorial services and otherwise not available to be viewed by the public. You can catch up on past posts HERE. 11. Do you think there will always be a need for museums? Yes. I don’t think this question is even worthy of debate… is it? 4. What’s that blog you really would like to get round to writing? 5. Which is your favourite museum? 6. What is your earliest museum memory and what emotion did it inspire? 9. Do you think there will always be a need for museums? 11. What’s the oddest search term that has led people to your blog? Answer the eleven questions – you can adapt them a little to fit your blog. 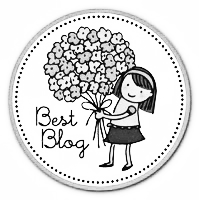 Include the BEST BLOG image in your post, and link back to the person who nominated you (that would be me, or this blog post). Devise eleven new questions – or feel free to keep any of these ones here if you like them – and pass them on to however many bloggers you would like to. I have referred to this week’s Find it Friday object in an earlier post (HERE) but now I have completed work on it I have decided to have a closer look. 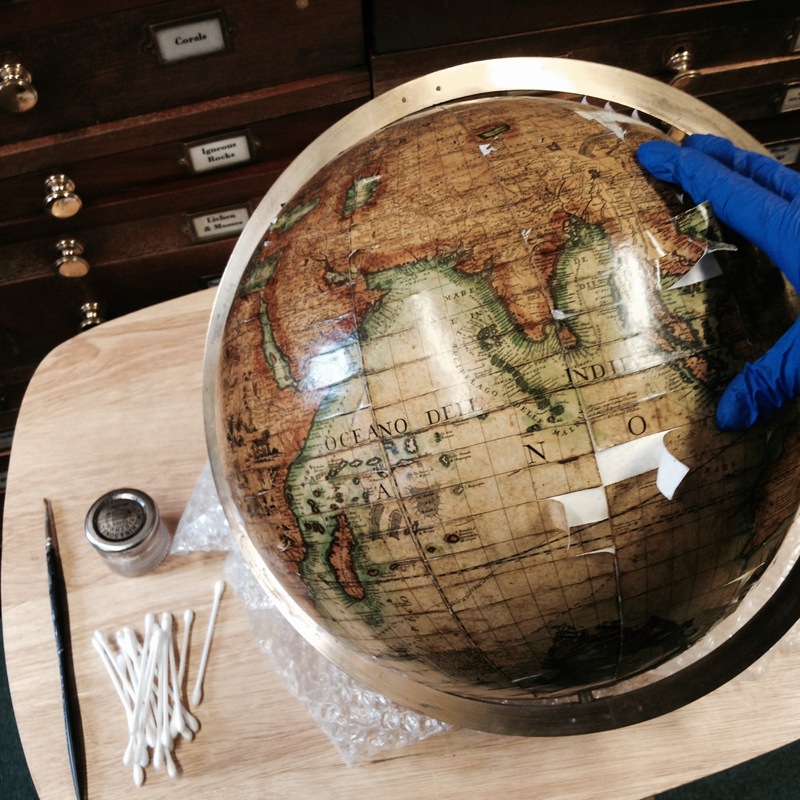 This Globe is part of the support collection that sits on site at Staircase House. It is located on top of a cabinet in the bedroom on the ground floor (known as the linen room). 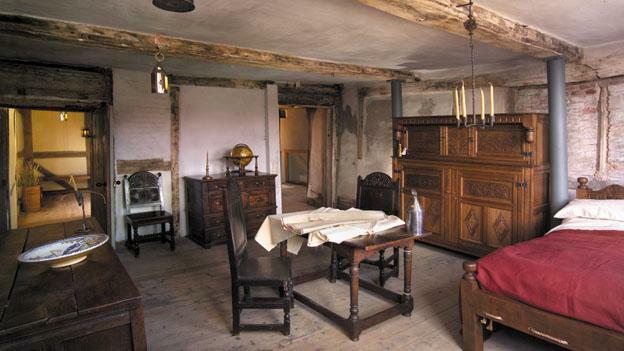 This bedroom has various uses; it is open to the visiting public and is also used as the setting of Samuel Pepys bedroom where he was sleeping when he was informed that the Great Fire of London had started on Pudding Lane in September 1666. This is, of course, part of the sessions put on by the Heritage Facilitators for education sessions and school visits. Stockport is quite a distance away from London and Pudding Lane is not visible from the windows of Staircase House! More recently this room has been used as a location to film scenes for the Channel 4 production, The Mill. Currently filming season two, this room has been used on two separate occasions in the past couple of weeks and will be used again to film further scenes for the show. However, this room is not being used as a bedroom, but as a tavern. This meant that all the objects we have in this room, including large pieces of furniture and the bed have to be removed and stored away every time. The first time the film crew visited and the objects were removed an inventory was conducted to assess that everything we expected to be there was there, we tracked the objects so everything was accounted for and we knew where they were located whilst not in their usual locations and a condition check was done to make sure all the objects were ok currently and were still ok after the film crew had left. This was important as some of our objects, such as a few chairs, stools, benches and tables were used in the room for the filming. This review highlighted one object as decreasing in quality and that could use some conservation work; the 17th century globe. This meant that instead of storing the globe away on site at Staircase House I was able to bring it back to the curatorial services and work on it so that when the room was redressed as a bedroom (after the second filming session, a few weeks later) it could be reintroduced into the display. 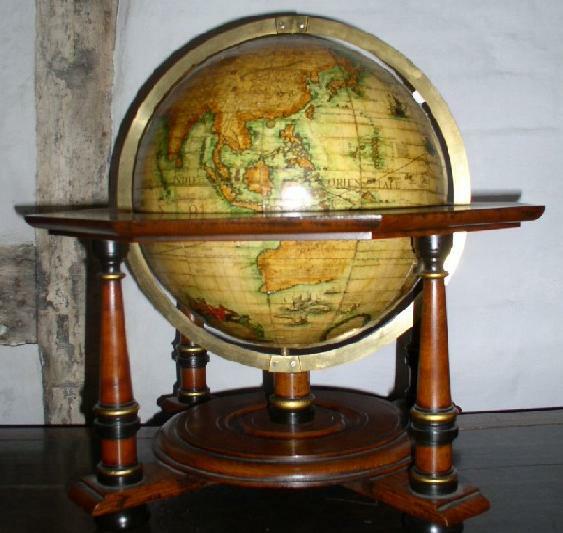 The globe sits on a wooden stand and is covered in small illustrations and beautiful geographical drawings and information, however, the globe is not completely accurate. It was only during the 16th century that the world began to be viewed as a moving object around the sun and with past disbeliefs, such as the well-known “the earth is flat” theories it is understandable that at this still relatively early time a lot remained unknown or misinterpreted about our home planet, Earth. The globe represents this; half of Australia is missing, Canada is on the right hand side of North America and Iceland is four times its actual size, just to mention a few. This though just gives the globe more character, and with illustrations of marine monsters swimming in the oceans and big cats dominating the African continent it is easy to get lost exploring this globe for hours. Unfortunately though the globe was starting to peel away from itself. Fortunately, this particular 17th century globe is a replica which meant, ethically, I could work on conserving it. Really this should be the job of a conservator, but we do not have one based here and any work is outsourced to a conservator in that specialty. For example, in the past year we have had a statue and numerous paintings conserved by different freelance conservators. This is extremely important. If an object is damaged or deteriorating its preservation is paramount. It is essential that it is not able to get any worse for that could result in the destruction of the object or cause it to become a hazard. After all, these objects are collection items, they are here to be cared for, and no one wants that to become the reality more often than can be helped. I used Paraloid B-72 (a non-yellowing, durable adhesive) and the solvent Acetone to painstakingly stick the peeling and upturned areas back in place. With a small paintbrush I mixed the two and glued the underside and then held the piece in place to allow it time to stick. I then removed any excess glue using pure Acetone to make it look clean, smooth and like new! Almost like new anyway. Because the object is not in a case but just on the side its able to be touched by visitors, which is most likely why it started to peel. With the more fingers that touched the weak paper the more it came undone and at some point some areas of the map had been ripped away, and that is a real shame. I looked around its home location to see if these pieces were on the floor, sadly with no luck. With such detailed illustrations it worries me of what was possibly lost on these sections. Furthermore, there was no way to find a matching image so I used as close to the map as I could find, another map to fill in the gaps, with as close colouring as I could match. These sections now are hardly noticeable, unless you know where to look. Again, this was ok as it’s a replica and part of the support collection. My aim was just to lessen the decline in quality and improve the overall appearance of the globe so it can complement the room yet again, to set the scene of Staircase House and be enjoyed once more by visitors and school groups alike. Which, I hope, is what I have done. “The GMMG (Greater Manchester Museums Group) is a partnership of eight Museum Services in the North West; Stockport, Salford, Oldham, Bolton, Bury, Tameside, Rochdale and Wigan. They have been working together as this group for over ten years to help bring their collections together, to unite them as an engaging and accessible collaboration for their own communities and each others. This allows each of the sites to showcase their collections on a much larger scale, to the people who can not actually visit their sites, to the larger population, nationally and indeed, globally. Just recently paintings from the sites returned to the collections after being part of ‘Towards Modernity: Three Centuries of British Art’, an amazing exhibition that took these paintings and toured them around various museums around China. This exhibition proved to be so successful that it reached, in one way or another, 90 million people. View images and read more about this exhibition HERE. But now the GMMG are working on another project, one named ‘Our Connected History’. Each of the 8 museums services have chosen 50 of their top objects. By top objects, we mean some of our objects that have intriguing and relevant histories, that show great captivating or educational qualities, and to be honest, some of the staffs favorite objects. These 50 objects from our collection and the others will make a group of 400 objects that will be able to be viewed on the GMMG website. Each individual object will have a quality photograph, some even 3D rotating images, alongside information about what the object is and why it is important to us and to the collection. This information has been written by the curatorial staff, the very people who look after the objects, but this is not the only format information will be available in. Some members of the curatorial staff have been recorded talking about the objects too, allowing for you to learn and explore via an insight into the passion that goes in to looking after museum collections. And so, this week, that website has gone live! So you can now learn a little more of these on the new website, along side 47 other objects in our collection and 353 other objects from around Manchester. It feels great to have been involved and to have seen this project grow from the beginning. From choosing the objects, writing the information to accompany them and having the photographer visit our site, seeing all that work come together on the final website is quite satisfying. I am always pushing to expose collections in various ways and this is an ideal platform for that. I am very happy with the outcome and excited to explore the other collections chosen by the other museums! Find the GMMG website HERE. Our Connected History HERE, and Stockport’s collection HERE. Whilst emptying the costume case at Stockport Museum (mentioned in an early post HERE) I came across a couple of objects that I didn’t recognise straight away but I would in their modern-day form without hesitation. 1900’s kitchen and could possibly be identified to the modern museum visitor as ‘Victorian curiosities’ as in appearance they look very interesting and compelling yet their use could only be described as the most mundane of tasks. This object comes for the 1890’s and is a vacuum cleaner. Whereas earlier vacuums were more elongated and pole like in shape, this model is beginning to take on a shape that we would recognise. The vacuum is made from wood with metal wheels to allow for movement. There is a larger wheel located on top of the vacuum cleaner with a wooden handle to turn it. As the wheel turns it causes the bellow-like pumps on the body to open and close, taking in air and causing a suction function that gives the object its name; the Volvac Continuous Suction No.1. This particular one is missing a hose and so is not a completely perfect example. However, I am finding it extremely hard to research any information into regards to this object so despite it being incomplete, it is a good piece to have if they are limited in numbers. This vacuum cleaner was bought for the collection in 1968 from a local shop in Adswood, Stockport. The second object is a large and bulky, wooden piece and is from the floor of the kitchen. It is a mouse trap. ….. and that few of these traps survive today as they were often worn out or thrown away. Our mouse trap was gifted to the collection in 1955 by a local resident of Great Moor, Stockport. For this post I am briefly going to recap four projects from the past month. 1. Whilst reintroducing the pieces of the Vernon Park collection to the stores I came across a box of exotic birds that were merely identified as ‘birds’ on their corresponding records and in the accessions register. These birds were dated at mid to late 1800’s and it seemed sad to me that they were not appreciated and understood to their full potential and so I set out to improve their records. I am no ornithologist, and unfortunately we don’t have one on site so there was no one really qualified to identified these birds. 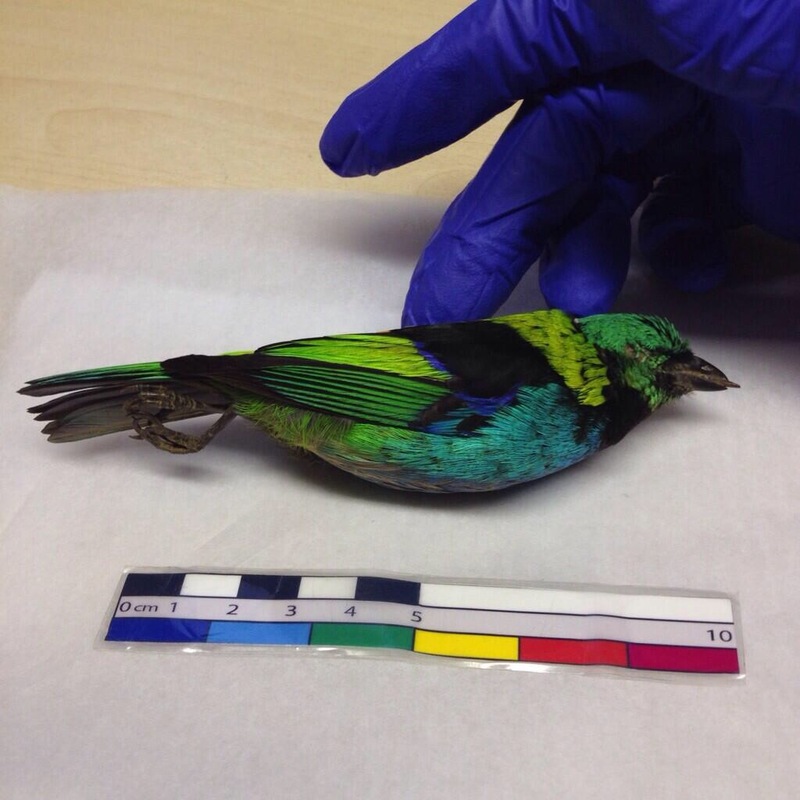 And so it was a hard task that involved a lot of research to eventually determine the species of the birds. A key tool in doing this was Twitter. As mentioned in a pervious #MOU blog, I believe Twitter to be essential use for museums and in particular for curatorial teams and this was one case that exceeded my expectations. I began by posting a few images of the birds, with included a vast collection of hummingbirds, and expressed my intentions to explore them further and within moments, after the use of the simple #ornithology hashtag, ornithologists and bird lovers were offering their skills and ideas as too what my mystery birds were. In no time at all the birds were identified and the information available in reference to them for the future was enhanced. This improves the overall collection and enables their use to become much more varied, from exhibitions to research tools. 2. Staircase House is a Grade II* listed medieval building dating from around 1460. It is one of our sites and is beautifully dressed with objects, some collection items, to set the scene. A cruck timber building constructed with wattle and daub Staircase House is a lovely building with exposed timbers and viewing galleries to see the material used to construct the walls, as you can imagine the building is a lovely location and one that has been in the past requested to be used as a filming location. Which is what happened last week; the filming of the second series of the channel 4 period drama, The Mill. Despite only filming for one day the curatorial team were on site for three days at Staircase House as work in the rooms being used had to take place. That work being that the collection items had to be removed. In respect to the period of the show and continuity, the filming crew brought a lot of their own props. Our items therefore had to be accounted for, tracked, wrapped in acid free tissue paper and/or bubble wrap, boxed and removed to insure no objects were damaged or lost. This happened in three rooms of the house and was done the day before. The day following the filming all the objects were returned. This provided the opportunity to review the objects, as they are able to be reached and touched by the visiting public any issues with the objects might have gone unknown until now. As well as this, the basic opportunity to clean the areas was now open to us. With a lot of big pieces of furniture being moved, under them was now able to be reached as well as the surrounding areas while the spaces were relatively clear, as well as the objects themselves, they were given a good dust before returning to their places in the kitchen, the linen room and the tallow room. 3. The review of the objects following the filming at Staircase House flagged one object as decreasing in quality and that could use some conservation work; a 17th century globe. The globe sits in the linen room at Staircase House on a wooden stand. It is covered in small illustrations and beautiful geographical drawings and information, however, the globe is unfortunately starting to peel away from itself. Fortunately, this particular 17th century globe is a replica which means, ethically, I can engage in some work upon it. I have been using Paraloid B-72 (a non-yellowing, durable adhesive) and the solvent Acetone to painstakingly stick the peeling and upturned areas back in place. With a small paintbrush I have mixed the two and have been, one piece at a time, gluing the underside and then holding the piece in place to allow it time to stick. Its become quite a job as the more I look and the closer I get, the more areas I find that could use some work. I will remove excess glue and clean the globe when I am happy with the images positions and hopefully the globe can return to the house and be enjoyed again for a long time to come. 4. Finally, almost a month ago now the rest of the Heritage Lottery Fund (HLF) trainees and I visited Gaskell House in Manchester. Frank Galvin was once part of the collections team here at Stockport and is now a trustee of the grand early 1800’s suburban villa. The house is listed Grade II* yet a large project is very nearly in its final stages to turn the former home of Elizabeth Gaskell, one of the 19th century’s most important women writers, into a visitor attraction. Katie S has written an excellent, in-depth blog post about the visit, the house and the project HERE.